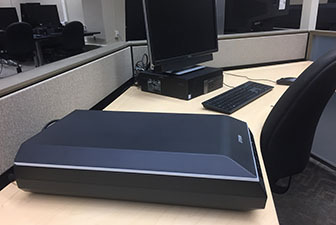 Use the MDRL to scan a variety of documents and media as well as print in various formats and sizes; instructions available on our Help page. The MDRL provides the following print services to eligible lab patrons. 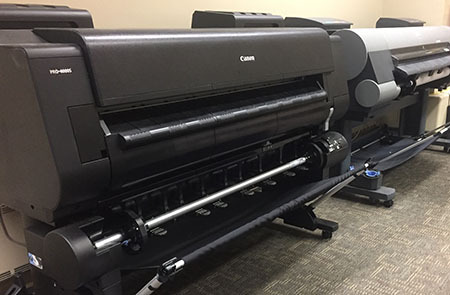 Large-format printing is a resource for students and faculty of Auburn University for class assignments or academic research projects. See the MDRL Help Desk for setup assistance and approval of large-format prints. Printing capability includes items up to 36" on one side, and printing is as available. Large-format prints over 17" and up cost $7.00 per page. Poster printing is restricted to class assignments, academic research projects and presentations. Fees are collected via bursar bills, and the charge does not apply to AU faculty and staff at this time. 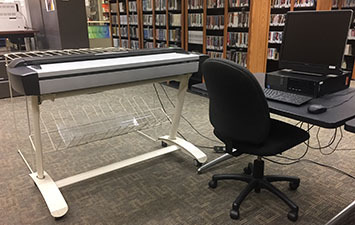 NOTE: The MDRL does not provide large-format printing for personal, campus organization, or departmental purposes. For example, we do not print birthday posters, Greek or campus event materials, or departmental signage. Currently, large-format printing charges do not apply to faculty and staff, however is limited to their conference and research prints. Color laser printing costs 50¢ - 70¢ per sheet-side. Black-and-white (monochrome) laser printing costs 10¢ - 18¢ per sheet-side. THE MDRL IS NOT A DROP-OFF SERVICE BUREAU. We will help you print, but you must visit the lab in-person. CHARGES FOR PRINTING INCLUDE ANYTHING THAT YOU ACCIDENTALLY PRINT. Think before you click print, and choose the self-service printer carefully! For example, printing a black-and-white document to the color laser printer will charge you the same as if it were in color. Be sure to proof your poster before you ask to print it. Additional prints result in additional cost. STUDENTS ARE RESPONSIBLE FOR ANY CHARGES INCURRED IN THE MDRL. Charges for printing in this lab go to the Office of the Bursar. If printing is included in your major or specific course as part of a lab fee or other means, those allowances DO NOT transfer to this lab. Student employees sent to the MDRL to print items for employers will be responsible for any printing fees. Students should make arrangements for reimbursement through their employer.